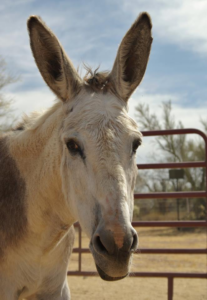 For April, Beading Divas Bracelets is excited to be fundraising for Zen Donkey Sanctuary in Marana, AZ. Clyde, the 40-something-year-old donkey, came to Zen Donkey Sanctuary following a failed euthanasia. The distraught owner explained that she had been advised to “put him down” due to advanced degenerative arthritis. Following being injected with the euthanizing drug, the veterinarian performing the procedure left the scene, not waiting for his final breath. Eight hours later this stoic creature stood up and began eating hay! With preparations being made for the 200-mile journey to Marana, Zen Donkey found to their surprise — a beautiful, gentle, elderly downtrodden donkey with the most amazingly telling eyes. This boy has seen a lot in his day and he exuded wisdom. Clyde had a broken-down arthritic body but no residual organ damage. The strength of his spirit and soul was beyond compare. This special creature was consistently tolerant, cooperative and compliant with all of the treatments, applications of supportive leg devices, multiple hoof trims for his devastatingly unattended hooves, medications for pain relief as well as any and all attempts to offer his weak body comfort. He understood that Zen Donkey was trying to help and he tolerated all attempts with patience, politeness and compliance. His care became an obsession. Clyde prospered and was finally at peace with the world. His coat became gloriously beautiful and was now able to bear weight on those crippled legs which supported his amazing soul. Clyde found his forever home and has been an inspiration. It isn’t often that one can say that a donkey has changed their perspective on life but as Clyde proved — teachers come in all forms. I’m glad Clyde and the other donkeys can find a loving home at Zen Donkey Rescue.